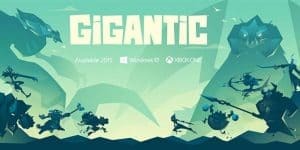 Gigantic Release Date July 2017 | Nerd Much? After being in open beta for so long, Gigantic is finally getting a release date, July 20, 2017 on Arc, Steam, PC, and Xbox One. For the last month of open beta, developers Motiga have expanded the game to Arc along with new features across the board. These new features come with the large update released today and include AI matches, a revamped tutorial, voice chat, and a new front-end user interface. For those lucky enough to be a part of the open beta, Motiga is celebrating it’s announcement of a release date by offering a login and play bonus. If you got the game via Arc today, you can receive an Arc Lightning skin for Tripp simply by logging in and playing one match. For the other platforms the game is available on, you can get the Excelsior skin for Tyto the Swift by doing the same. Motiga is also providing a Founder’s Pack, on sale for $29.99 from $39.99, that includes all 18 heroes, two as yet unannounced heroes, and more unique rewards that have not yet been specified. For anyone wanting to get a head start in the game, this Founder’s Pack is for you. Be sure to get it while you can, as it disappears forever come the game’s release date July 20, 2017. For those that don’t already know, Gigantic is a free-to-play strategic hero shooter developed by Motiga. Despite Overwatch generally outshining all hero shooters that came after it, Gigantic manages to standout with it’s beautiful art, unique characters, and gameplay. It’s not just the run and shoot of Overwatch, as there are two teams of five players pitted against each other, and each team has a Guardian. These are huge creatures that can cause a great deal of damage, and it’s important for players to strategize around them. In addition, you can also use magic in this game, something that Overwatch lacks.